Featuring LiteGears new CineMitter series of applied-phosphor LEDs, these new emitters set the standard for cinematic, colour-correct LED lighting. Efficient and full-spectrum, these LED chips offer state-of-the-art output with a 40% increase in brightness over VHO Pro. Another distinct feature of the CineMitter is the extended Kelvin range. LiteGear pushed the lower CCT to 2600 degrees Kelvin (K) allowing for candlelight or deep-tungsten output while increasing the CRI to a staggering 95+- that's nearly indistinguishable from traditional incandescent sources! On the cool side, the CCT was pushed up to 6200k to better balance for overcast sky or cool white fluorescents. This increase in CCT still achieves a CRI of 95+ and provides beautiful, full-spectrum daylight. 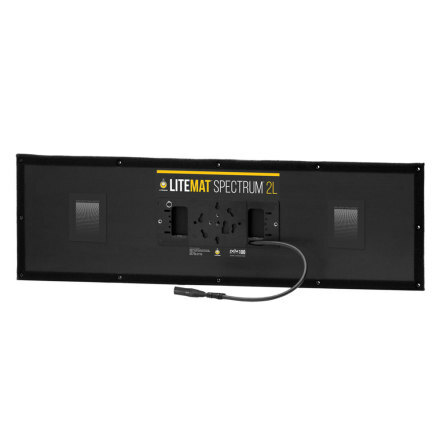 LiteDimmer+ Plus DC200V is the ideal portable companion for powering +Series fixtures. With a focus on DC input power, the 200W unit can be powered using typical V-Mount compatible batteries. Optionally, an external AC powered, 12 volt power supply can be used and attached to the battery mount with the optional power supply mounting plate. The LiteDimmer+ Plus' rugged housing includes several different mounting options including four 1/4-20 threads for attaching clamps or brackets.